We love to welcome guests to this traditional holiday cottage in rural Perthshire. There is off-street parking available on the drive in front of the property. There is level access to the accommodation and it is all on one level inside. 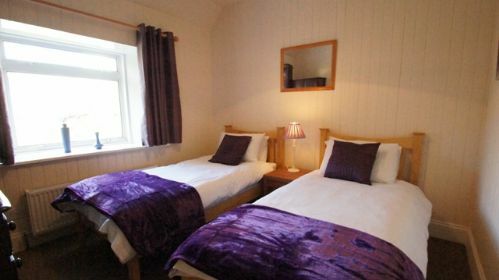 The cottage sleeps 4 with a double and twin room. There is a family bathroom with a shower over the bath, toilet and sink. The lounge has a log-burning stove with welcome basket of logs provided. There is sofa seating for 4, television with FreeSat and WiFi is available. Guests will also find information on local attractions and things to do. There is a fully equipped kitchen and a separate dining room seating 4. Outside there is a garden area and garage. The garage is accessible to guests and there is a small pool table and table football available for guests to enjoy. This was a return visit to Fern cottage and Killin village, as we had stayed here for new year/Hogmanay two years ago, and as usual we had a wonderful, restful holiday there. This is a superb cottage in a great location and as usual met all our expectations. 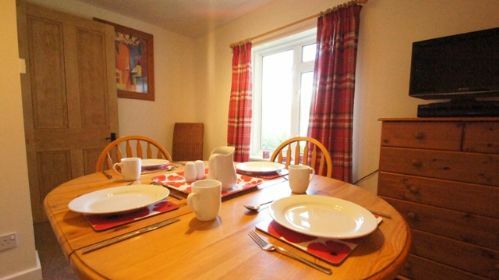 Very neat and well- presented, the cottage was comfortably furnished throughout and had a nice cosy feeling. It was suitably warm, as is needed during the winter season and it was great to know that we had a lovely relaxing place to return to at the end of each day of travelling around. Fern cottage has a great location just a short distance from the centre of Killin village and all its amenities and is situated among a number of houses and cottages on one of the roads above the beautiful Dochart falls and so is in a lovely, peaceful location and amongst scenery of outstanding natural beauty. From one of the rooms where we had our meals, there was a view of the river Dochart and of part of the old bridge that crosses the river there. Although from the lounge window another cottage can be seen, there are wonderful views of the surrounding mountains to look at and wake up to each day and immediately adjacent to the cottage, there is a pretty garden that is on a slightly lower level to the rest of the property. Access to the property was good, as the parking was on the same level and immediately adjacent to Fern cottage and as the cottage itself is all on ground floor level, it is ideal for anyone with mobility difficulties. Equally, it could appeal to keen walkers, as there is so much wonderful hill and mountain scenery to explore in the locality and the Ben Lawers mountain range and nature reserve is just up the road from Killin above Loch Tay. From the exterior, the front entrance of the cottage gives the impression that the property might be smaller than it actually is, but the property stretches out quite a long way back and really Fern cottage is deceptively spacious and quite roomy, and benefits from having a separate lounge, kitchen and dining room. 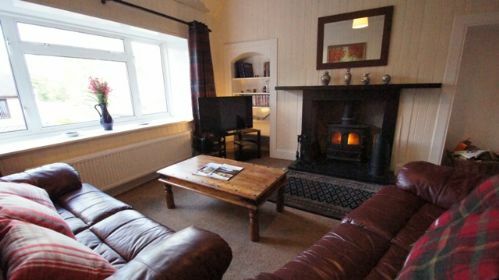 The comfy lounge has cream wood panelled walls and a lovely traditional style fireplace in keeping with the rural location and period and style of the cottage and has a large screen tv. A very welcome added bonus was that there are also some smaller standard sized televisions to be found in the dining room and in both bedrooms, and my husband and son were also pleased to find they had access to yet another extra room, which had a pool table for them to enjoy. 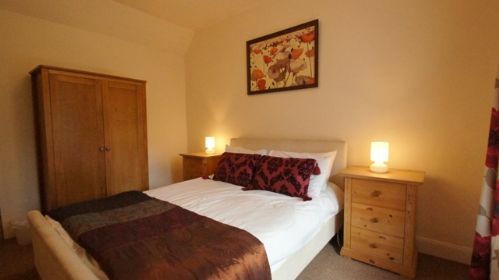 Fern cottage has two very comfortable, nicely furnished bedrooms and quite a large, spacious bathroom, which was well-presented and very clean. The well-organised kitchen was immaculate and was furnished with light-coloured units and had plenty of cupboard space and benefited from having energy saving devices such as a dishwasher. Someone from the cottage company was there on arrival to make sure that the cottage was sufficiently warm and well -heated and they also provided a warm and friendly welcome for us there by leaving some Christmas cake, shortbread and oatcakes, and some wine and chocolates for us to enjoy. They had also very kindly taken the time to set up a lovely Christmas tree in the dining room, which we really appreciated, as it added to the seasonal holiday atmosphere there and made us feel very welcome. Killin village has excellent amenities and has a supermarket, chemist and newsagent and has some interesting old hotels and pubs, which have lovely scenic locations and some amazing views, one just by Glen Lochay and another above the beautiful Dochart Falls, and all of them surrounded by the wonderful mountains of the Ben Lawers and Tarmachan range. The approach to Killin village is very scenic and passes Loch Lubnaig, the Strathyre forest and the amazing rugged beauty of Glen Ogle, and all the wonderful fir and pine trees that line the road near Glen Ogle towards Glen Dochart. The village has a spectacular location and sits with its’ picturesque waterfall and traditional cottages and houses beneath the shelter of the splendid beauty of the mountain, Ben Lawers, which is the tenth highest mountain in Britain. Killin is a great central location for exploring the Trossachs and Loch Lomond National Park, with access to wonderful inspirational places like Balquidder and Loch Voil, St Fillans and Loch Earn, and Loch Venachar, Loch Achray and Loch Katrine, just a short drive away. It is also possible to reach Glencoe, Kilchurn Castle and Loch Awe, Loch Fyne and Inverary, and Pitlochry and the Cairngorms on a slightly longer drive. So, all in all you could not ask for a better location for exploring this beautiful part of central Scotland and of course Loch Lomond and the wonderful area of mountain, sea lochs and forest around Arrochar and the Argyll forest. This is a great place for spending time outdoors and in the fresh air, with plenty of loch and forest trails and cycle paths to explore, some starting from Callandar and passing through the Strathyre forest and Glen Ogle, following the route of the old railway and crossing an amazing mountainside railway viaduct. The Queen Elizabeth Forest Park is within the national park and is an outstandingly beautiful place and has lots of waymarked trails through forested areas and around lochs so there are plenty of opportunities to enjoy nature and lots of possibilities for outdoor activities. (The lovely brown, russet and green colours of the forest and mountains during the winter season were spectacular!) One of our favourite trails that we would recommend is the one around Loch Katrine, which has a superb tarmac path around the edge of the loch, which rises through beautiful wooded areas, passes pretty waterfalls and crags and has beautiful Ben Venue, Loch Katrine and its islands as a constant view and the Arrochar Alps in the far distance. Even during the winter season, there is the possibility of a boat trip on this wonderful loch, but we were slightly too late getting back from the trail, to be able to make this journey. From Fern Cottage, there are so many beautiful places to explore and one of our favourite drives that is quite local and not too far away is the wonderful drive over the Dukes pass from Aberfoyle to Loch Achray, as there are such exquisite views of the Trossachs forest and Loch Achray, looking like a marvellous, magical, forested fairy tale style landscape. There is a brilliant café to stop off at by Loch Venachar on the way back, that has good food and lovely serene loch side views. In the other direction from Aberfoyle, on a narrower road, it is possible to reach Loch Chon and Loch Ard, and also Stronachlar, which is on the other side of loch Katrine, so offers a different perspective of this stunning loch. Beyond here the wonderful remote Loch Arklet can be found, and also Inversnaid, where there is a hotel and waterfall and a splendid view of Loch Lomond and the Arrochar Alps. Another drive that is slightly further afield that we really enjoyed and would highly recommend, as it is so unforgettable, is the journey to Glencoe via Bridge of Orchy, the Black Mount and Loch Tulla, where there are more stunningly beautiful views. The journey across the lonely and vast wilderness of tawny brown, flat moorland, bog and lochs, which is Rannoch moor, has an astounding beauty and a startling other worldly quality, especially as the whole area is surrounded and enclosed by other mountain ranges and leads to a striking view of one of the most iconic mountains of Scotland, Buchaille Etive Mhor, which stands at the approach to Glencoe and leads on either to lovely Glen Etive (a film location for “Braveheart”,” Outlander” and the James Bond film, “Skyfall”) or to another amazing view of the mountain range called Bidean nam Bian, part of which can be seen from the road and is popularly known as the Three Sisters .The car park here is sometimes quite busy, but it is well worth the stop for a photo of this striking and unique mountain landscape. My son photographed it with a group of people exploring the lower path below the three mountain ridges, which really captured their scale. The whole area around Glencoe is very photogenic and quite atmospheric and has a ski centre and the Kings house hotel, where deer can often be seen in their natural setting, roaming around the land and grounds quite close to the hotel. On reaching Glencoe village, we were pleased to find a reasonably short, but lovely trail around Glencoe lochan, which has beautiful picturesque views of the loch, forest and mountains and a few seats and picnic tables around the edge of the loch, so it was an ideal place for a stop and to enjoy some lunch there. Other great picnic spots closer to Killin are beside beautiful Loch Lubnaig, which has wonderful views of high forested mountains with log cabins below and lovely views along the loch, and also at St Fillans and along Loch Earn, where there are fine views of Edinample Castle and of the mountains and loch from the regular parking places and picnic spots that can be found along the side of the loch. From Killin village there are paths that lead to Glen Lochay, which has magnificent mountain views and a waterfall, and closer to the village there is a path that leads to the very atmospheric and quite eerie Finlarig Castle, and also another path that leads to the top of Loch Tay, and at the far end of Loch Tay near Kenmore, there are some more picnic tables and a superb view of Ben Lawers and of the whole length of the loch. It was a wonderful holiday experience to be able to be based at Fern Cottage and Killin village again and to be able to immerse ourselves in the magnificent landscape that surrounds them. We appreciated the comfort of the cottage and convenience of its location and knew from our previous experience of staying there, that it was very good, reliable, well- organised and maintained accommodation and that it was a great place to have a holiday. We also appreciated the opportunity to spend more time outdoors and amongst such lovely scenery, and in such a wonderful, natural, unspoilt environment, that made us value the natural world around us even more, and allowed us to return from our holiday feeling refreshed and having had a very enjoyable time. We would strongly recommend Fern cottage, Killin, as a great base for exploring this fabulous part of central Scotland and the Trossachs and Loch Lomond National park and absolutely loved our time there. Thank you so much for this review. It means a lot to us that people enjoy their stay at our cottages. We are pleased to hear that you enjoyed your visit and it sounds like you managed to pack a lot into your holiday. We hope to see you again soon. This was my first stay at Fern Cottage and I'm already looking forward to a return visit next year. The cottage is furnished to a high standard, very well-equipped, very clean and is in a great location if you're looking to tick off a few Munros. There are lots to choose from within a reasonably short drive. The cottage is also only a few minutes stroll from a good selection of places to eat and drink or to stock up on your provisions. Thank you for your review. We're glad to hear you enjoyed your stay. Killin is a great spot for munro bagging and other outdoor activities. We look forward to welcoming you back again in 2019. Comfortable. Well equipped. Clean. Warm. Nice welcome pack. Good base for nearby hill walking. Good supermarket and restaurant options locally. Thank you for leaving a review. We're glad to hear you enjoyed your stay. Centre of Killin near the falls of Dochart. Plenty of nice easy walks in the local area. 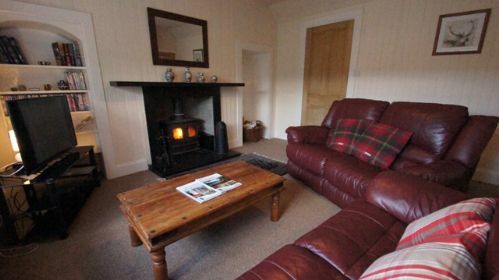 The cottage is well equipped and comfortable and with the real fire place a cosy place at night. Thank you for your review. We're glad to hear that you enjoyed your stay and some of the local walks. The log fire is nice to have. Staying at Fern Cottage was an absolute pleasure. I think it was better than the photos showed. We didn’t want for anything - from an arrival drink to salt and pepper for chips! They have literally thought of everything. The cottage was well situated, extremely clean and we had lots of fun playing pool. A fabulous cottage which we hope to go back to next year. Thank you for your review. We're glad to hear that you enjoyed your stay at Fern Cottage and we'd love to welcome you back again. Onyl stayed 2 nights and didn´t use 2 of the rooms at all. Unfortunately a bit expensive for 2 people for 2 nights, but that was what we could find at the time. Two of the rooms were not used at all. 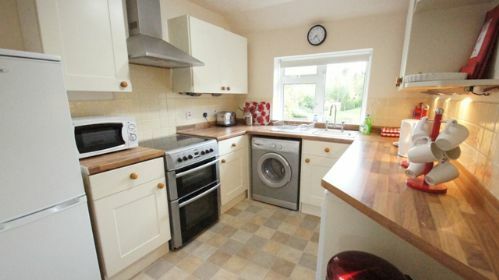 Lovely modernised house, perfect for a family of 4. Kids loved the games room & we loved the log burner! lovely cottage - location, facilities, comfort. So cosy and warm too. Thank you. Cooper cottages very easy to deal with and accommodating. Killin good base for winter walking, even the weather was good! Many thanks for your review. We are glad to hear that you enjoyed your stay and look forward to welcoming you back again soon. Nous avons passé un superbe séjour dans un décor magnifique. un cottage très agréable avec tous le nécessaire. Une arrivée et un départ très facile avec le système de code. Nous le recommandons avec plaisir. Super place to stay. Cosy and everything you need. Great location for getting about. Recommend a stay here! Just spent a week in Fern cottage in Killin. Lovely village, Lovely area lovely accommodation the cottage was spotless and really good. Nice touch was tea and biscuits on arrival. Just like to say, as we paid for the week, we didn't reall like the Coppers Cottage Holiday Let advertising board on the front of the property. Made us feel as though we were being branded ! Other than that really nice place. Dave & Suzanne from Folkestone. Thank you for your review and comments. We are glad to hear you enjoyed your stay at Fern Cottage. Fern cottage was one of the nicest we have stayed in. Could not fault anything and great location. Fern cottage was one of the nicest we have stayed in and if in Killin again would definitely go back. We are glad to hear you enjoyed your stay at Fern Cottage in Killin. We do our best to maintain the cottage to a high standard. 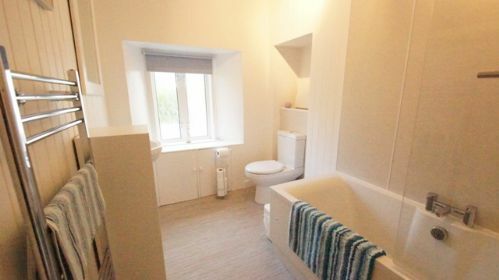 This is a superb cottage for two people ; with four i tend to think that some areas would seem inadequate- the bathroom,for instance, and the twin bedroom. The price is quite high,and there are many vacant weeks.But, the external look of the place does not reflect the quality of the interior. Thank you for taking the time to leave a review. We appreciate your comments and these will be passed on to the owner. The new bathroom and central heating system does enhance the interior. The warm weather this week has allowed the garden and outside painting to be done. Fern Cottage provided a wonderful home base for my family while we relaxed and explored one of the most beautiful regions of Scotland. The location is perfection. Killin is a nice sized town with a grocery, post office, and a few restaurants and shops - and of course the picturesque Falls of Dochart, which you can even hear from the cottage. We enjoyed exploring some of the recommended nearby sights (Finlarich castle, the Old Yew Tree of Fortingall, Loch Tay, Ben Lawers, etc. ), and we were within close proximity to the train station in Crianlarich (which is on ScotRail's scenic West Highland Line) as well as the A82 (running from Glasgow to Loch Lomond to Glencoe to Fort William). On days when we were not out exploring, we enjoyed the cottage itself, and were so glad we were staying there instead of in a hotel room. There was plenty of room for everyone to spread out, and we saved a great deal of money by being able to cook our own food. Both of those benefits were especially value early in the week when we all we jet lagged - we could watch television in the living room at odd hours or raid the refrigerator at 3am without disturbing each other. The only room that feels a bit too small is the one with two double beds - it's tight if you have two people staying in it, as there is not much space other than what's occupied by the beds themselves. Otherwise, the cottage is quite roomy, and even the kitchen and bathroom are generously sized. All beds, bedding, and sofas were noticeably comfortable, and all rooms - including bathroom and kitchen - were spotless and well-furnished. The kitchen is nicely equipped with both cooking and serving dishes, and we were even welcomed with tea, milk, and shortbread upon arrival. All communication with Cooper Cottages was prompt and very polite. Our one special request was cheerfully honored, and the check in process was very smooth. I would stay at Fern Cottage again without hesitation and recommend it to anyone who is considering it for their holiday! We had an enjoyable holiday at Fern Cottage and had a very restful and relaxing time there. 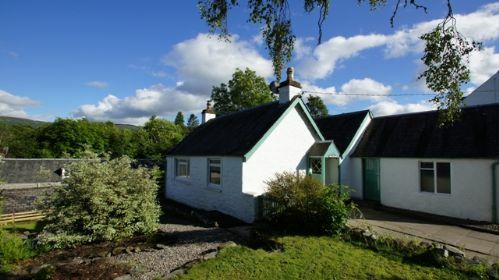 The cottage is in a good position and is situated close to the centre of the Highland village of Killin, and is just up the road from the very scenic and beautiful Dochart Falls. Killin has a spectacular mountain setting below Ben Lawers and has good amenities, including a supermarket, newsagent and hotels, and is ideally situated for exploring central Scotland. 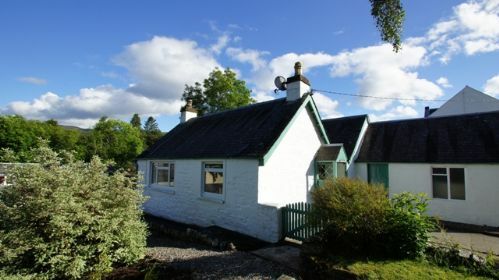 The cottage is situated within the Trossachs and Loch Lomond National Park and is close to Loch Tay, Glen Lochay and Glen Lyon, with the villages of Kenmore and Aberfeldy within a thirty to forty-minute drive, that passes along Loch Tay and has a very good view of the mountain Ben Lawers. The Kenmore hotel is one of the oldest hotels in Scotland and has a poem that was handwritten in pencil on the wall above the fireplace by Robert Burns on one of his visits there. Aberfeldy has a good book shop and good amenities and has a tourist information centre and a variety of shops. There is the possibility of travelling further and exploring Pitlochry and the Cairngorms on a longer journey. The spectacle of Rannoch Moor and Glencoe were just fifty minutes from the cottage, and the scenic journey via Loch Awe and Kilchurn Castle to Inverary and Loch Fyne was about the same distance. The striking view of the mountain called the Cobbler and the Argyll forest at Arrochar took a similar amount of time to reach, with the opportunity to travel on further through to a beautiful mountain pass called the ”Rest and be Thankful”, which can serve as an alternative route to Loch Fyne. Callander is the nearest town and had a supermarket and a good selection of shops and was about a thirty- minute drive, with lovely views of the Strathyre forest and an amazing view of Loch Lubnaig on the way. Loch Venachar is a good place to break a journey to Loch Katrine and had an excellent café overlooking the loch. Loch Katrine, which is the inspiration for “The Lady of the Lake” poem by Walter Scott, took about forty-five minutes to get to, and had a good path around the edge of the lake, with some information about the poem at some of the viewpoints. Balquidder is a thirty- minute drive, and is the resting place of Rob Roy Macgregor. Stirling Castle and the Wallace monument are about forty-five minutes away. So, this cottage is not only set in a very peaceful and beautiful place and amongst outstanding scenery, but is also perfectly located for an interesting exploration of the history of this part of Scotland. The cottage itself was quite traditional and was a single storey building with level access throughout and no stairs. To the side of the cottage there was a pretty garden and some of the surrounding houses had gardens that sloped down towards the edge of the River Dochart. There was a good parking space and drive right next to the cottage, so there were no worries about parking. The interior of the cottage was much roomier than it looked from the outside and was very cosy and comfortable, and immaculately clean. It was warm and well-heated, which was just what we needed for our winter break. We were left welcome gifts of chocolate and wine on arrival, which were much appreciated by all. The cottage had good facilities and was well equipped throughout-the kitchen had a dishwasher and there was a TV in both bedrooms and another TV in the dining room. The dining room was a pleasant room to enjoy our meals in and had a lovely view towards the Falls of Dochart. The lounge was traditionally styled and had a large screen TV and two very comfortable sofas to rest and relax on in the evenings, and was equipped with a log burner for extra heat if needed, but the central heating was sufficient and worked well. The wifi was efficient and we were able to browse the internet without any problems, and the signal was so good that our son was able to keep up with his team and watch a football match on his iPad. 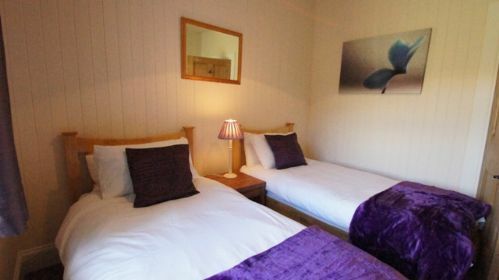 The bedrooms were nicely presented and were comfortably furnished and had plenty of storage space for our clothes. We were all able to sleep well, due to having had plenty of fresh mountain air and the very comfortable beds that were provided. The twin room was smaller than the double room, but had enough space and storage. The kitchen and the bathroom both looked quite new and were nicely styled and spotlessly clean. The kitchen had a pleasant view of the adjacent gardens which swept down towards the river. 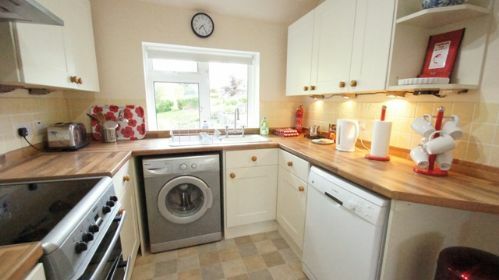 It was a reasonable size and was light and bright and fitted with cream/white units and had plenty of cupboard space. It was well equipped and had a large fridge freezer and washing machine, as well as the dishwasher. Within the immediate vicinity of the cottage there were plenty of well -surfaced paths that circulated around Killin, and led to Finlarig Castle and Loch Tay, and also Glen Lochay, and so we were able to spend plenty of time in the fresh air and enjoy being outdoors. Glen Lochay was easily accessed and had a waterfall and panoramic views towards the mountains. (My husband found out that Killin and the Bridge of Lochay hotel and Glen Lochay itself were places that were mentioned in the old Robert Donat film of “The Thirty- Nine Steps”, which was based on one of his favourite books by John Buchan). The amazing cycle path that follows the route of the old railway across the mountains at Glen Ogle was a ten- minute drive, and Loch Earn was about fifteen minutes or so from the cottage. For keen walkers and mountain climbers, the whole area is superb and my husband was able to enjoy a regular early morning walk or jog in the hills and glens around Killin. One of the highlights of our stay at Fern Cottage was the opportunity to watch the New Year and Hogmanay celebrations in Killin village from the back door of the cottage, which had a good view of the old bridge over the Falls of Dochart and the people of the village gathering on the bridge to celebrate the New Year. My husband and son were able to share in this experience and gathered on the bridge with everyone else and returned to the cottage as the New Year drew near. We were entertained by music as the New Year approached and watched an amazing firework display and listened to a Scottish piper and more music after the New Year struck. We would certainly recommend Fern Cottage and Killen village for anyone wanting to experience New Year and Hogmanay celebrations in Scotland. The cottage is a good size and is very comfortable, and is ideal for either a winter or summer holiday. It is in a good position and is a great base for exploring this area of Scotland, and has so many interesting and beautiful places close by. Thank you for your review of Fern Cottage. It is much appreciated. We are glad to hear that you had an enjoyable New Year break at the cottage and found lots of things to do in Killin and the surrounding area. The cottage exceeded expectations, it is in excellent condition, clean, warm and very well equipped. I also had my breakages deposit paid within 2 hours of leaving! I was really pleased with my choice and I'd definitely recommend this cottage and Coopers Cottages. Many thanks for taking the time to write the very positive review. We are happy to hear you found the cottage to your satisfaction and that you were comfortable there. An outstanding property; warm, comfortable and spacious. It was also well situated, within walking distance of all facilities. My only criticism was of the oven; this has been used, and not cleaned, and is giving out acrid fumes when in use. No single guest can now be expected to clean it up. Thank you for leaving a review. We are glad to hear you found it comfortable. Regarding the oven, I am sorry to hear you had this problem. The property is cleaned following every stay, and we had not heard of this issue from previous guests. I will get the oven checked before the next guest arrives. Ideal centre for Scottish Munros. 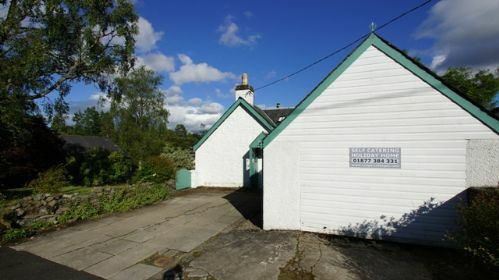 We were 3 adult men needing convenient accommodation for a week so as to access the local mountains (Munros) This cottage is simple but well equipped and well placed for the shops, pubs and eateries of Killin. It is situated in a non-descript but very quiet road. The great advantage over B&B accommodation or the hostel in Crainlarich is the freedom to come and go as needed as well as being able to spread out maps, books and laptops without having to clear up each night. Kitchen well equipped but small; there is a separate dining room. The sitting room was fine as were the bedrooms although the twin bedded room was small. The only toilet is in the bathroom so a second separate loo would be an advantage. Central heating so efficient that we never bothered with the wood burner. Overall it suited out purposes ideally. Thank you for taking the time to write this review. We are glad that you enjoyed your stay at Fern Cottage, and the local walks in the area. Thank you for this wonderful holiday. We can recommend this beautiful little house warmly. 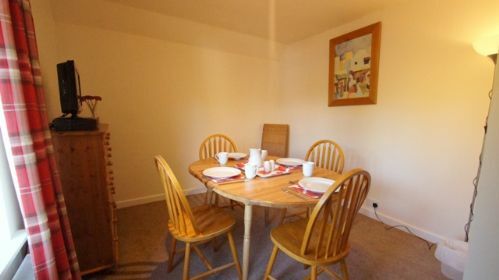 It is perfectly and beautifully situated and very well equipped for 4 people. It was the starting point for many beautiful motorcycle tours across an impressive country. If there would have been a German TV program no wishes were left open. This was our first stay in Scotland, but certainly not our last. Thank you for your kind review. We are glad that you enjoyed your stay at Fern Cottage and managed to get out and explore the area. Fern Cottage was fitted to a good standard and provided everything we needed for a very enjoyable stay. Centrally located in Killin but in a quiet side street, there are restaurants and shops within easy walking distance. As the kitchen was well equipped we made use of the relatively good selection in the near by co-op and farm shops in the areas to cook and eat in most evenings. Literally only 2 minutes walk to the Falls of Dochart, so really easy to pop down in the morning or evening for the best light - without all the tourists. Lots of good walks in the area and the local munroes are very doable. On the business side, the booking process was straight forward and friendly. Check-in was easy and the deposit had already been refunded the day after we got back. For us, staying with cooper cottages ticked all the boxes and we will definitely go back again. Thank you for taking the time to leave this review. We are glad to hear that you enjoyed your stay in Killin and look forward to welcoming you back in the future. We enjoyed Fern Cottage for 2 weeks and is was a really nice stay! With 3 persons in a cottage large enough for 4 we had a good time. The location was very good, Killin is rather in the middle of the middle of Schotland! And beautiful and spectacular walks "just around the corner”. The cottage has lovely rooms en enough spaces for clothing. The kitchen was more than good enough equipped to make your own meals. 1 - The mattresses on the beds were somewhat old. 2 - We are used to sitting outside in the garden (In Holland it’s about the same whether ... ) so we missed a set of garden chairs and table. 3 - At one day the cottage was entered for perhaps some reparations of or controlling the electrical system, but this was done without consulting us. The door was unlocked when we came back and the small door above the entrance (where the electrical systems center is) was still openend. And we had not done that for sure. We didn’t miss at hing so that wasn’t the problem, but it is nice to get a message beforehand if someone has to enter our cottage, or at least afterwards. Thank you for taking the time to leave a review of Fern Cottage and thank you for your comments regarding improvements. The owners will check the mattresses and perhaps buy some garden furniture based on your comments. As for the third point, I apologise that we did not inform you of somebody entering the property. In future we will make efforts to do so. I am glad to hear that you enjoyed Killin and some of the great walks in the area.